In any case, the humility of Pastor Adeboye is well-known and reflected in everything that surrounds him. It has also become the hallmark of The Redeemed Christian Church of God, which he has led since he was appointed the head of the Church in 1981. This piece is an attempt to bridge the gap regarding necessary information about the General Overseer. The intention is that the members of his congregation as well as other Christians and Non-Christians alike can learn something about his life, humble beginnings, relationship with God, career and Christian ministry, and also that it is only through total dedication and commitment to God that man can achieve true holiness and elevation. Pastor E.A. Adeboye was born on 2nd March 1942 at Ifewara in the present day Osun State. His parents (now of blessed memory) were indigenes of the town, which is about midway between Ilesha and Ondo towns. He had a strict Christian upbringing which was engineered by a church going culture, the prevalent style of Christianity in those days. This church-going attitude gave him an appreciation for God, but made no extraordinary or outstanding Christian out of him. He underwent primary and secondary education which was almost curtailed due to the lack of funds. Barefooted and in tears, he recalls that for the first seventeen years of his life, he never had shoes to wear.” However, as God would have it, he survived against all odds to graduate from the University in 1967, at the age of 25. Between 1967 and 1975 he had added two more degrees; a Masters (M Sc.) in hydrodynamics and a Doctorate (PhD) in Applied Mathematics, and lectured at the University of Lagos and university of Ilorin. Before his lectureship at these Universities, the G.O had taught mathematics at two secondary schools i.e. Okeigbo Grammar School, Okeigbo near Ondo and the Lagos Anglican Girls Grammar School, Surulere, Lagos. It would appear that his academic and professional career and achievements greatly prepared him for the office into which God was to call him later on. His childhood Christian background had taught him to appreciate God in the ordinary sense. However, it was not strict enough to preclude him from being an active young man engaging in all the perks to which a young lecturer and an educated man was entitled, even though he was married. 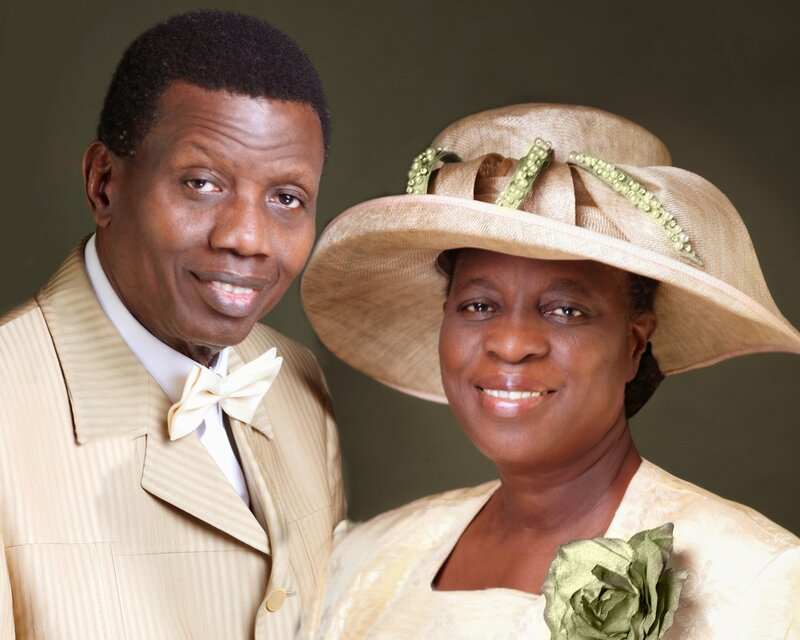 Married in 1968 to his wife, Pastor (Mrs.) Folu Adeboye, the young couple was faced with the problem of recurrent caesarian operations by which his wife had delivered their first two babies. Medical science had diagnosed that in view of the formation of the pelvic bones, having babies by natural means was impossible and as such advised the couple against having more children. A solution had to be found. His Christian background did not preclude him from trying out other areas outside of his Christian belief where solutions might be found. In any case, his Yoruba cultural background was not averse to syncretism. “Olorun ko ko aajo”, God (or belief in Him) is not opposed to native remedies; his people are wont to say. The implication of which is that if prayers are not effective, the nature medicine-man is available. As part of the solution-seeking odyssey, the young University teacher and his wife were invited to the Redeemed Christian Church of God by his uncle, Rev. Chris Fajemirokun. Though lead by unlettered men, the visibility of the power of God was not lost on the young couple. The church was then headed by Pastor Josiah Oluwafemi Akindayomi, the General Superintendent (GS), a man who did not have any formal education and spoke no English but his native Yoruba language. However, compared to his own educated mind, this man and the other men of God in the church were infinitely superior to him in the knowledge and ways of God, and especially in their examination and exposition of the Bible. The sermons of the GS and those of his lieutenants were quite incisive, thought-provoking and soul-stirring. Here were men who despite their educational handicap would not compromise God’s standard. It was also here that he learnt that his way of life would lead him directly and unwaveringly in only one direction – HELL FIRE! He also learnt of the importance of looking up to Jesus as the Author and Finisher of our faith and the need to cast all our cares upon Him. So on 29th of July 1973 when the altar call was made in the church for those who wanted to surrender their lives to Jesus, forsake their sinful ways, and become born again, the young man, who was to become the General Overseer of the church rushed forward in a remorseful show of penitence and gave his life unto Jesus! Reflecting later on his conversion he said, “Something overwhelmed me that night that I was close to hell and I didn’t know it. I suddenly realized that it is possible to have all the PhD’s in the world and still be on the losing side. I knew all the formulas but I did not know the one to eternal life. Life took on new meaning for the new convert as he now immersed himself totally in the work of God. The zeal for God became a consuming passion, and everything concerning him began to take a new turn. The difference between life as a Churchgoer and as a born-again Christian and child of God became manifestly clear. He put God first in everything and became baptized by immersion in water in September 1973. As a worker in the church, he labored assiduously to propagate the gospel of Jesus Christ through his personal life, evangelism, crusades etc. It was therefore no surprise when two years later on September 14, 1975, he was ordained together with four other men of God, as a Pastor of the church. By this time, in view of his ability at interpreting, he had also become the English language interpreter to the General Superintendent, whose sermon was given in the Yoruba language. To test their new faith in the Lord, and standing upon His promises, the Pastor’s wife who had been asked to stop bearing children became pregnant again. In the fullness of her term, she was delivered of a baby boy in 1978 at the church’s maternity center in Ebute-Metta, Lagos. The baby, who came against medical advice was delivered naturally by the Church’s midwives and was named OLUWADAMILARE. This miracle birth was a source of joy to the couple and they never tired of showing him off to friends and family as a physical manifestation of God’s faithfulness to those who serve Him in spirit and in truth. A second miracle baby followed in 1982 through the same process of natural delivery, at the same maternity center run by the church and by the same church midwives. The baby, named OLUWAGBEMILEKE became the final confirmation by the couple to their friends that with God nothing shall be impossible, and that when you are totally committed to and dependent on God, He will not let you down. At the Holy Ghost service of January 1997, the GO gave a personal testimony about total dependence on God, which related to his first miracle child. He recalled that when in 1981 the baby fell ill he prayed, fasted, spoke in tongues and generally travailed for the child to no effect. In fact, the condition of the child worsened day after day as the baby refused to eat. On the tenth day, contrite and utterly broken, he now besought the face of the Lord –“Daddy, why have you refused to heal my child?” God replied him, “Since he is your child, you heal him yourself?” Well in that case, recanted the man of God, “Daddy, heal your child.” And to the glory of God, in a moment of time the child had begun to play and hunger for food. The appointment of Pastor E.A. Adeboye to the leadership of the Redeemed Christian Church of God as the General Overseer had been revealed even before he became a member of the Church. The revelation had come to the General Superintendent of the Church in the early70’s that his successor would be a young educated man?. In those days it was very rare to see young educated men, especially University graduates in Pentecostal Churches, which were considered to be too fanatical for their own liberal consideration of life. Rather whenever they choose to attend churches, they settled for the more conventional ones which did not quite infringe on their freedom to continue to revel in the passions of the flesh. Thus when the young University lecturer became a member of the church in 1973, Pastor Akindayomi (the GS) was able to recognize his successor in the spirit, as the person the Lord had spoken to him about. His burning zeal for the Lord, his readiness to learn, even from people far intellectually inferior to him, his intensive study of the word of God as contained in the Bible further went to confirm the veracity of the revelation received by the General Superintendent. Coincidentally, about five years before he became the General Overseer of the church, Pastor Adeboye himself had some revelation concerning the appointment. After sharing it with his wife, they had been in complete consternation, and had fervently prayed and fasted for God to allow the cup pass over them. However, only the will of God would prevail. One year before the event, he had another divine revelation concerning the appointment. Before passing on into glory, the General Superintendent had revealed to select groups of the Church’s Council at different instances, the divine will of God regarding his successor. From human perception, it was hardly comprehensible that a young man aged thirty-something, who had just joined the church recently, would become the leader of the church. These ment passingover quite elderly men in their late forties, fifties and sixties who had been in the church for between fifteen and twenty years! He also revealed that those who might not wish to see the fulfillment of the wish of God would be removed by God himself without affecting the progress of the church. In any case, God had said that His ways are not our ways. The will of God eventually prevailed and on 21st of January 1981 (seven years after accepting Jesus as his personal Lord and Savior), Pastor Enoch Adejare Adeboye, at the tender age of 38 was consecrated as the leader of the Redeemed Christian Church of God, and chose the title, General overseer.